The Dolly Eye: Icy Melon (Honey Brown) Lens review!!! I’ve been really loving these lenses. At first when I looked at the design it kind of freaked me out because it didn’t seem so natural in photographs- and the colour… well the colour seemed a bit odd. But after some thinking and then mustering up the courage to get them it was all well worth it. I really love these lenses! They’re comfy and makes you look like a dreamy doll~ LOL. This is what they look like in the case. 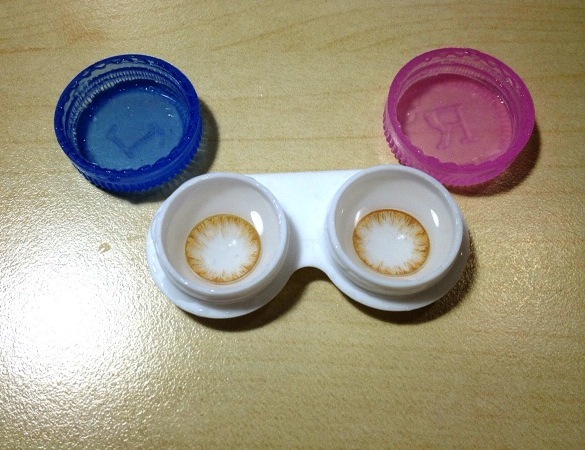 The lenses are from The Dolly Eye’s Icy Melon series. They come in pink, violet, green, blue, honey brown and grey. 14.8mm in diameter and 38% water content. Pros: It’s simple, It’s odd because its so different from other lenses but makes your eyes look dreamy. If you have brown eyes, the honey brown makes your eyes look like its gradating in colour which looks quite pretty~ It draws more attention to your real iris rather than the lens itself. Perfect for a wintry princess sort of look. The colour opacity is quite strong so there’s no need to be afraid of it not showing. (For those who are worried if the colour doesn’t show up for cosplay or other purposes). The regular diameter of the lenses and its simple design make them really comfortable to wear. I tend to find lenses with a lot more design a lot thicker and irritating to wear >W<! Cons: If you pick a colour that contrasts with your eye colour then i’m afraid it’ll look quite unnatural and probably even pretty bad. I think this lens look best if you try and match it with your real eye colour or if not- you’ll really have to match it with a makeup look or else it’ll look weird. Another thing you want to keep in mind is whether or not how big your real pupil is. Because the design is only on the outer edges of the lens and fades in, if you have really small pupils then some eyewhite might show before the design reaches your pupils :L!!! Other than that there’s not much that i didn’t like about these lens!!! The right colour can really bring out the original colour of your eyes and looked more natural than I thought they’d be~ :D! Hope you liked the review~~! Stay safe and take care! I love to wear coloured contacts, I have 8 pairs in different colours and designs. I love your blog and the lens pair is beautiful. 😀 same! I’ve grown to really like this pair! They look very nice on your eyes! Blend well, I think.